Fr Armand de Malleray FSSP will offer Mass in the usus antiquior at Tyburn Convent on Saturday 18 September at 2pm, before the Papal Vigil in Hyde Park. The Mass will be offered for the conversion of England and will be celebrated in the Crypt which houses the Martyrs' Shrine and many relics of the English Martyrs, as well as artefacts associated with Catholic life in penal times. 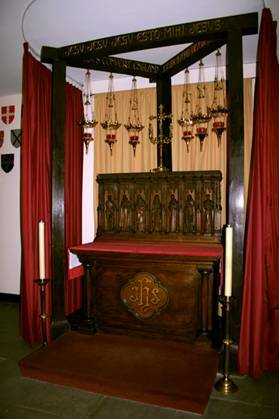 The picture above shows the altar in the Crypt chapel with the altar surrounded by a replica of the triple gallows at Tyburn from which many of our martyrs were hanged. Tyburn Convent is just along Bayswater Road from Marble Arch. (Postcode W2 2LJ) Google map. The Holy Father is expected to arrive about 6.30pm. The vigil ends at about 9pm.